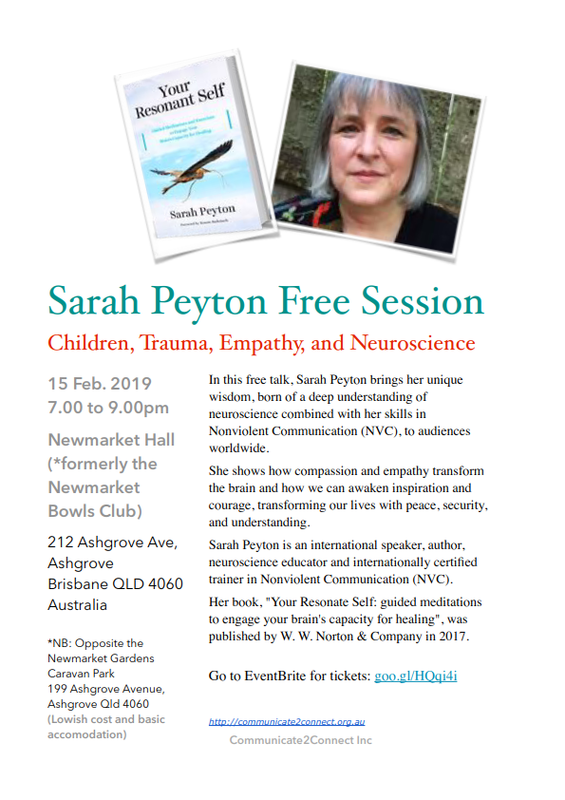 Sarah Peyton Free Session – Children, Trauma, Empathy, and Neuroscience – Communicate 2 Connect Inc. In this free talk, Sarah Peyton brings her unique wisdom, born of a deep understanding of neuroscience combined with her skills in Nonviolent Communication (NVC), to audiences worldwide. She shows how compassion and empathy transform the brain and how we can awaken inspiration and courage, transforming our lives with peace, security, and understanding. Sarah Peyton is an international speaker, author, neuroscience educator and internationally certiﬁed trainer in Nonviolent Communication (NVC). Her book, “Your Resonate Self: guided meditations to engage your brain’s capacity for healing”, was published by W. W. Norton & Company in 2017.